Honeywell has expanded its Zephyr airflow sensor HAF Series portfolio with new digital versions that provide airflow ranges of 0 to 20 SLPM (Standard Liters per Minute) and 0 to 200 SLPM. With this new product, the supplier has leveraged its original Zephyr building block airflow sensor via a bypass to the main flow channel of the sensor, eliminating the need for a customer-designed bypass in equipment such as ventilators. Customers can now choose between creating a separate bypass or using one included in the sensor. These sensors are configurable and customizable with multiple interface and package options, a variety of flow ranges, and custom calibration. 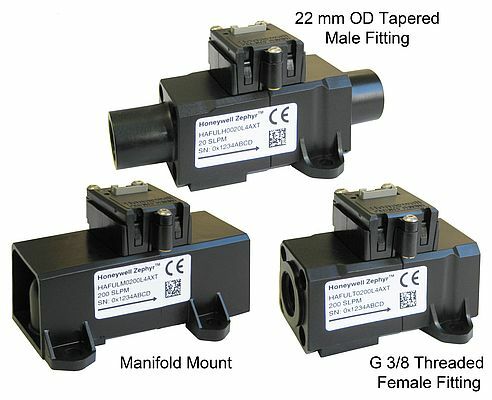 The new airflow sensors are designed to function in a wide range of applications. Potential medical applications include anesthesia delivery machines, laparoscopy, patient monitoring systems, spirometers, ventilators and ventricular assist devices (heart pumps). Potential industrial applications include air-to-fuel ratio, analytical instrumentation, fuel cells, fume hoods, gas leak detection, and gas meters.